The new generation of retirees are rethinking housing and are not ready to just settle down anywhere. They require an active lifestyle, with a sense of community. This generation of seniors wants to make new choices about how and where they want to live as the demands of aging bodies and minds force them to make different decisions about their residences. Nursing homes and assisted living facilities aren’t the only options for seniors who simply don’t want to live alone. 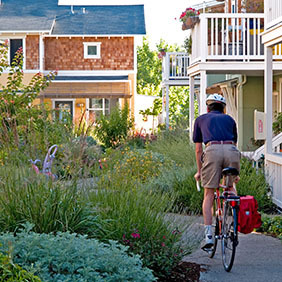 Cohousing solutions are designed to allow individuals to live independently while sharing community space with other residents. In a cohousing solution, seniors purchase a residence—whether an apartment, a house, or some other solution—that has everything that would be found in a normal environment. In addition, however, they have communal space—a community room or gardens, for example—that they share with others in the community. Typically, the community does not include medical professionals or others who are responsible for providing care, but cohousing members may band together to help one another. In a house sharing situation, the homeowner invites a roommate or two to move in and share both the residence and the associated expenses. This is a great way to make handling chores easier, and it also alleviates feelings of loneliness. The house sharing situation is dependent on how many people the home owner is comfortable with inviting, and a house may be shared by two individuals alone or by as many individuals as there are bedrooms. Housing co-ops allow individuals to purchase houses or apartments in the area. They’re typically not segregated by age, but in some cases, they can be. These co-ops share certain community responsibilities, like maintenance and lawn care or gardening needs. Naturally Occurring Retirement Communities (NORC) are an aging in place initiative is a program of The Jewish Federations of North America (JFNA). There are 157 federations with a community-based network of 1300 health and social services providers providing humanitarian assistance to millions of people nationally and abroad. In a Naturally Occurring Retirement Community there isn’t a deliberate decision to fill an area with seniors. Instead, they happen to live there already. The difference, however, is that they choose to live together in order to share responsibilities and care to make life easier for each other. Grocery runs, trips to the doctor, and other necessary appointments are easier when there’s a community to help share the responsibility. They might also share hired help when necessary. If you are interested in finding out more about this retirement option, visit the official page Naturally Occurring Retirement Community (or NORC). Life Plan Communities—the rebranded continuing care retirement communities —are designed to provide younger seniors with a place to live where they can continue their independent lifestyle. Life plan communities offer seniors plenty of opportunities to get out and live, then gradually offer increasing levels of care as they age. Retirement living isn’t just about separating seniors from the rest of society—and seniors aren’t the only ones who need affordable housing models. Intergenerational housing allows individuals from different generations to live and work together. Seniors provide their wisdom, while younger generations offer their knowledge of the modern world. It doesn’t just take a village to raise a child. Villages are also necessary for seniors to live active, fulfilling lives even as the demands of aging start to cause problems. Villages combine volunteers and paid help to give seniors the attention and care they need, which includes someone who will run to the grocery store for them or provide transportation to a doctor’s appointment, as well as offering help with maintenance tasks. The help allows seniors to continue to live independently. Nursing homes aren’t the only option for seniors who are aging and no longer able to care for themselves the way they once did. Now, there are a wide variety of options that enable seniors to choose the living situation that works best for their needs and desires. Careful planning long before the retirement years makes it easier for seniors to decide what type of community will work best for them and prepare their finances for that decision. Jason Williams is a communication and content specialist at Senior Planning Services. Senior Planning Services assists Medicaid applicants and their families with the application Medicaid process.